Note 1. Aringhi Roma Subterranea, l. 1, c. 25. Note 2. Noris, Diss. 3, de Epochis Syro-Macedonum. Note 3. Apol. c. 21. Note 4. Plato in Phædo. Martyrs at Rome during the Diocletian persecution (302 or 303). 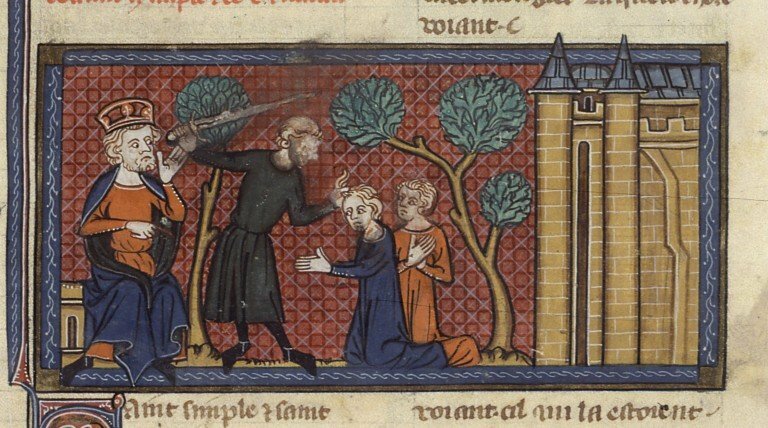 The brothers Simplicius and Faustinus were cruelly tortured on account of their Christian faith, beaten with clubs, and finally beheaded; their bodies were thrown into the Tiber. According to another version of the legend a stone was tied to them and they were drowned. Their sister Beatrice had the bodies drawn out of the water and buried. Then for seven months she lived with a pious matron named Lucina, and with her aid Beatrice succoured the persecuted Christians by day and night. Finally she was discovered and arrested. Her accuser was her neighbor Lucretius who desired to obtain possession of her lands. She courageously asserted before the judge that she would never sacrifice to demons, because she was a Christian. As punishment, she was strangled in prison. Her friend Lucina buried her by her brothers in the cemetery ad Ursum Pileatum on the road to Porto. Soon after this Divine punishment overtook the accuser Lucretius. When Lucretius at a feast was making merry over the folly of the martyrs, an infant who had been brought to the entertainment by his mother, cried out, “Thou hast committed murder and hast taken unjust possession of land. Thou art a slave of the devil”. And the devil at once took possession of him and tortured him three hours and drew him down into the bottomless pit. The terror of those present was so great that they became Christians. This is the story of the legend. Trustworthy Acts concerning the history of the two brothers and sister are no longer in existence. Pope Leo II (682-683) translated their relics to a church which he had built at Rome in honour of St. Paul. Later the greater part of the relics of the martyrs were taken to the Church of Santa Maria Maggiore. St. Simplicius is represented with a pennant, on the shield of which are three lilies called the crest of Simplicius; the lilies are a symbol of purity of heart. St. Beatrice has a cord in her hand, because she was strangled. The feast of the three saints is on 29 July. Acta SS., July, VII, 34-37; Bibliotheca hagiographica latina (Brussels, 1898-1900), 1127-28. APA citation. Löffler, K. (1912). Simplicius, Faustinus, and Beatrice. In The Catholic Encyclopedia. New York: Robert Appleton Company. MLA citation. Löffler, Klemens. “Simplicius, Faustinus, and Beatrice.” The Catholic Encyclopedia. Vol. 14. New York: Robert Appleton Company, 1912. St. Felix II has the extraordinary distinction of being not only a pope and saint himself, but the great-grandfather of another pope and saint, Gregory the Great. Felix had been married, but his wife had died before he became a priest. He was a member of an old Roman family of senatorial rank. Pope Felix sent legates to Constantinople to summon Acacius to Rome, but to his dismay the Pope discovered that his legates had approved the election of the Monophysite Peter as patriarch of Alexandria and had communicated with heretics–in short, had sold him out. Felix held a synod at Rome in 484 at which he excommunicated the untrustworthy legates. He also excommunicated Acacius, but the patriarch remained stubborn. Thus started the Acacian schism in which Constantinople was officially separated from the Roman Church over the Henoticon. Even after Acacius died, the schism dragged on until the next century. In the last years of this pontificate Theodoric led his Ostrogoths into Italy to defeat Odovakar and take over the rule of Italy–all in the name of Emperor Zeno. Though an Arian, Theodoric treated the Church well. It was different in Africa, where in the early years of his reign Felix heard anguished cries for help from the hapless Catholics. Hunneric, the Arian Vandal, ruthlessly harried the poor African Catholics. Pope Felix got Emperor Zeno to bring his influence to bear on the fierce Vandal, but this accomplished little. After Hunneric died, the persecution slackened, and the Pope then helped to get the Church in Africa on its feet. He followed the usual papal policy of mildness towards weak brethren who had given way in the storm. Pope St. Felix died March 1, 492. He is buried in St. Paul’s on the Ostian Way.